So here I am, the beginning of week 3 at the new job, and things are moving right along. Today I got my cast off and was given a removable brace to wear for the next 3 weeks until I go back to visit. This means I can shower without my plastic arm condom, I can scratch my itches, and I can lotion my horribly dry skin. I can also do things that hurt. But I'm supposed to be moving around. My doc is not sending me to physical therapy, but I'm sure he will if I don't do what I'm supposed to do on my own. Which I askeered of because it hurts. But overall it is doing better. This is a picture I took with my iPhone of my x-ray that was taken today. Work is going well... I really like my co-worker. We went for adult beverages last week and she is fun and smart and ballsy. I've noticed this about women I tend to befriend. They have these qualities that I wish I had in higher quantity: assertiveness, courage, confidence. I can list many of my best girlfriends over the years that are very similar to each other in this respect. Especially female lawyers I know and have worked with. I am drawn to them, and I know it's in an attempt to borrow some of their magic. Just a little pattern I've noticed. My therapist would be so proud of me for acknowledging that little need in myself. I'm moving this weekend. I am excited about the new place but I do so dread the actual moving. And yet, I've done it like 5 times since I started this blog. Ok, four. This will be #4. My kitties are not yet aware, but I'm hoping they'll be fine. There are windows that have wide enough sills for their large rear ends, and that's the most important thing to them. The weather here can't make up its mind... blue skies and warm on Saturday morning, one inch of snow on the ground today... I'm hoping that Spring sticks around because when I move the winter clothes are going into storage. Don't tell, blogosphere, but I'm blogging from my new job! And it is so far so good, as I begin my 2nd week here. Everybody's nice, I can tell I'm totally going to be friends with these people, and the work so far has actually been interesting. Stuff that's not entirely familiar to me, so it keeps my attention while I learn it. It took me about 3 days or so for my brain to kick in, and all of a sudden there was this sense of "Oh, yeah! I remember this now!" Things started coming back to me pretty quickly. My arm is holding up pretty well. The typing makes it sore, but not unbearably so and I spent the weekend resting it. Last week (before I came in for my first day) I got a regular cast in place of the post-op huge one I had been wearing. That one had gotten very loose and was actually causing pain because my arm was not very secure. This one is much tighter and feels better. Except for when I have an itch and I can't get in there to scratch it... I don't want to stick anything in there, not only because I'm "not supposed to," but especially because I have that incision in there and I do not wish to open it up by accident. With the old cast I could get my fingers in there and reach most itches. I am no longer seeing the guy I was seeing (Aruba guy). And I am very proud of myself because I have never broken up with anyone in my life with the exception of my high school boyfriend. I don't break up with people, and if they don't break up with me I end up married. It would have been very easy to allow this to go that route. He is a great guy, very nice, very smart, has a good job, really liked me, treated me very well... it just wasn't going to work. And so I had to man up. And I think we will still be friends, which is nice. Five and a half years ago, I started having pain in my right wrist. It coincided with my first regular use of a laptop computer and its track pad, and I believed the two were related. Six months later I went to see an Ortho doc about it. He sort of blew me off, but explained to me that my ulna bone was too long, and the only thing he could do for me what shorten it surgically. What happens is the ulna is longer than it should be, and therefore bumps into the little tiny bones and the tendons in the wrist causing friction, inflammation, and damage to the bones, tendons and cartilage. But I'm not big into surgery, so I thought I'd just keep wearing my wrist brace. Last year, my primary care doc began to suspect that I had Rheumatoid Arthritis. She sent me to a Rheumatologist who didn't see any signs of RA but was concerned about the considerable pain I was still having in my wrist. He sent me to a hand specialist. She confirmed the "too long ulna" diagnosis, as well as the fact that there's nothing else to be done. She tried a cortisone injection, but it did nothing. I began to consider the surgery. This fall, my wrist was really bugging me. The pain had progressed to the point that I absolutely HAD to wear the brace, and even then my wrist would still hurt. And there was no way it was going to get better, only worse. So at the end of the year I signed up for the best health insurance program offered at my job and planned to take the plunge. Here are some photos of the procedure. The reason this patient needed surgery is not the same as mine. The surgery usually is recommended for people who break their radius-- when it heals, it heals shorter than it was previously, and the ulna is now too long. 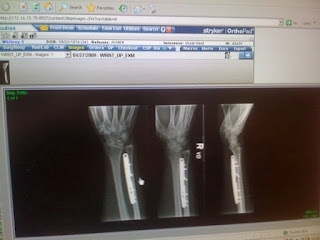 That wasn't my problem-- I was just born this way-- with 4mm too much ulna. My left ulna is also too long-- but it doesn't have as much pain as my right because I am right handed. It hurts a little now, and one day may progress, but because it is used much less I don't plan on having it shortened. So, Tuesday March 31st I had the surgery. For the past week I have mostly slept. My arm hurts. It doesn't like typing, but I have trouble staying out of touch with the world. :) It has definitely improved, which actually makes me try to do too much, which causes pain... but I'm hanging in there. And Monday I start my new job! Big stuff happening. Just wanted to update the blogosphere and let you know I'm still here-- I'm just partially out of commission.